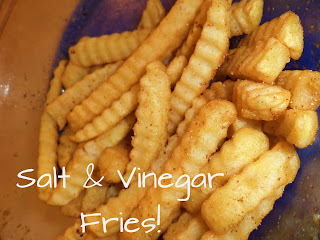 Mama Love: Salt & Vinegar Fries!! Every time we go to Buffalo Wild Wings my husband orders their Salt and Vinegar Fries, I personally hate Salt and Vinegar Flavored anything but he likes them so I decided to try my hand at making these for him homemade, and you wouldn't believe how easy they are to make! 1st soak your uncooked fries ( I used frozen but you can go all Martha Stewart on these and use homemade) in about 2 cups water and 6 TBSP Vinegar, and let them sit 30-45 minutes. Once they have soaked drain them and try to get most of the moister off (I tossed them in the strainer with a paper towel). After draining then choose your method of cooking to bake or fry, I didn't go healthy on this I mean they're french fries so I threw them in the fryer. After they are all cooked place them in a bowl and add 2 TBSP of Vinegar and The amount of salt you like cover with a lid and Shake them until your heart's content they are all coated! Then Voila you are all done and ready to enjoy your tasty faux Buffalo Wild Wings Salt and Vinegar Fries! Hope you enjoy, this was my first every attempt at this recipe so let me know how it works or how to improve it! Your recipe is trash Thank You for ruining dinner �� wow!! !